This 1 or 2 deck automatic card shuffler is a great gift for the card player who thinks they have everything... Or get 1 for yourself and spend more time playing and less time shuffling. No more hassles during the card game! 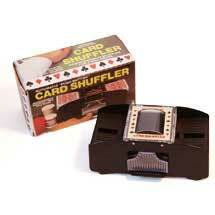 Get professionally shuffled cards every time at the touch of the finger! Operates on 2 "C" Batteries (not included).